Measurements: 2.75 x 4.3 inches; or 70 x 110 millimeters. Back of card: For a magical deck, a magical diagram: Yellow lines on a mauve background. Distinct when upright or inverted, so when it's inverted the magic is inverted as well. Book included: Yes, 276 pages, 5.9 x 9.1 inches, or 15 x 23 cm. Text by Louis Martinie. Comments: A strong, powerful deck. There is enough magic in the deck & book to get you into serious trouble and nothing to get you out of trouble once you get in. Remember that in all forms of magic, it's easier to get into trouble & harder to get out of it than novices imagine. On the other hand, there's nothing here that will kill you. As for the "real stuff", there's not a trace. If you want that (and you probably do, that's why you're reading this), you'll still have to find a magician to initiate you. Here's a useful hint: As long as you're looking for him, he'll avoid you. It's not personal, it's just the western version of "one hand clapping". The deck: There are the usual 22 major arkana, plus a Wild Card, shown above, which makes a total of 79 cards. Some card titles are given in Creole, which is distantly recognizable as French. Suits: Petro (fire/wands); Santeria (pentacles); Rada (air/swords); Congo (cups). Court cards are Houngan (king); Mambo (queen); La Place (prince/knight); and Hounsis (princess). Remember that if you call spirits, those that appear will exactly reflect your moral purity and that, once present, will not be under your complete control. These two facts should give pause. Voodoo has long been strong in Haiti & there are related reasons why that country has always been a mess. 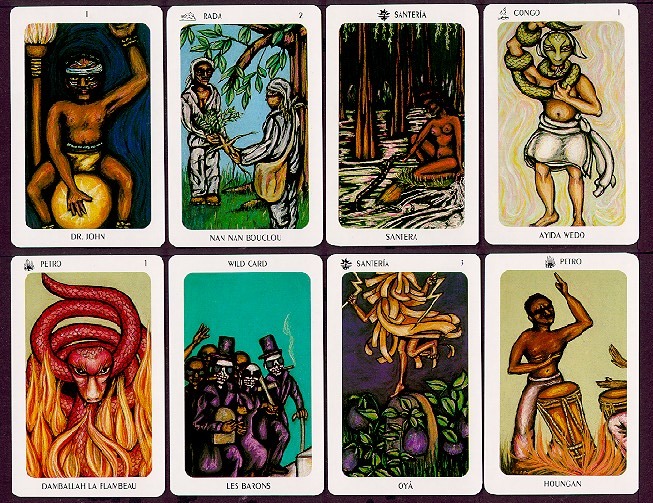 But this deck is New Orleans voodoo, not Haitian nor west African.